In the mid 1980s the music usually known as soukous from the countries then known as Zaire and the Congo was my favourite African music. I was as crazy for it as I’ve ever been for any music and I bought almost every LP that came my way. The shouted exhortations to the guitarists and dancers, the zippy guitar lines, the sometimes jazzy R’n’B feel of the horns, the clattering drums, its sweetness and joie de vivre all combined to lift my heart and move my feet. As a DJ I loved spinning soukous in the clubs of San Francisco, at least those that were open-minded enough to hire me to play the mix of musics then known as world beat. This was several years before the “invention” of “world music” at the notorious Empress of Russia meeting of various English music industry dissidents, malcontents and hustlers — but that’s another story. Soukous appealed to me as a DJ because it was basically impossible to mix on the beat with the songs frequently beginning slow and working up to a frenzy. To tell you the truth, I was a pretty lousy beat mixer anyway, but I liked doing fades from song to song. The varied pacing of soukous with its relatively long songs, its focus on having a good time, and its occasional sonic ferocity fascinated me in other ways. It was at once both a contrast to prog rock, pub rock and punk — all musical genres I admit I had previously obsessed over — and a strange combination of their significant elements. At the time, soukous also provided a welcome relief to the dismay brought about by the right-wing crackdowns of Reagan and Thatcher, which were beginning to bite down hard on our accustomed freedoms of previous decades. It was fun music, nothing much political to it. Even though it came from countries suffering through the post-colonial traumas that have become such ugly ongoing features of the world today, it was escapist to us and didn’t have the political-correctness baggage that South African music had with the then-current struggle against apartheid. Kanda Bongo Man was the artist I absolutely adored. His cries of “Ambiance! Ambiance!” just enthralled me and Diblo’s guitar carried me right along into that ambiance. In 1984, I embarked on a bicycle tour of southern England. After a few days of slogging along the South Downs, we reached Petersfield in Hampshire, which may be considered my hometown if I have to have one (I wasn’t born there and haven’t lived there since 1966, but a few years of moderately happy childhood were spent there). There, I picked up a copy of NME, then still a readable and credible music magazine. I learnt that Kanda Bongo Man was to perform at the Ashton Court WOMAD festival, on the outskirts of Bristol, that weekend. We got on our bikes and rode for three days along the edge of Salisbury Plain, straining ourselves up and wearing our brakes out down the sides of some steep and narrow valleys. We even stopped to look at the cathedrals of Winchester and Salisbury on the way. On the morning of the fourth day, we were lost riding around Bristol looking for the festival. Eventually we found it. Kanda Bongo Man was superb — the first live soukous I had seen. Afterwards riding back in the dark to our campsite in Bath, my girlfriend fell off her bike and broke her arm. Such was the feel-good power of soukous even that didn’t ruin our day!! The history of soukous is a complicated tangle of shifting alliances between musicians with added difficulties for outsiders due to the frequently long Lingala names and the geographical confusion of the two competing capital cities of Congo and Zaire, Brazzaville and Kinshasha, facing each other across the Congo River, not to mention the changing names of those countries. It is much and variously told in African music reference books. There is little agreement even about the name used for the music, some preferring rumba, rumba rock, or various Lingala words referring to specific styles covered by the convenient overall umbrella of soukous. Perhaps the quickest, more detailed introduction for the neophyte is the Wikipedia page on the subject. In its heyday, soukous was popular throughout Africa, pretty much the fabled Pan-African sound, with substantial migration of musicians to both Kenya and Abidjan in Côte d’Ivoire. Later, as conditions worsened in Zaire, Paris became a place of refuge and many musicians relocated there. However, ultimately Paris was not good for the music. Production styles became increasingly technological with drum machines and synthesizers substituting for the musical interplay between humans. Much of the emphasis even shifted from the music to the extravagant high-style suits worn by the musicians. The sapeur movement, as this was known, was considered to be a sophisticated fashion statement and “the antithesis of hippiedom.” To this old hippie, it was more like the antithesis of music. Thankfully, in the past few years artists such as Kékélé, Sam Mangwana, Papa Noel, and Mose “Fan Fan” have all revived the earlier, more organic styles of Congolese music with an impressive series of releases. 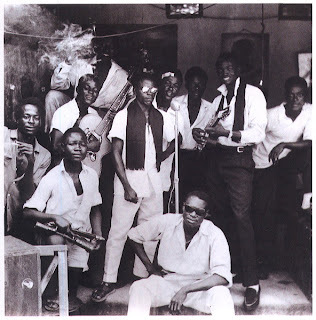 RetroAfric, Crammed, Syllart, and Network Medien have all released reliable compilations of the early days of Congolese music, while Stern’s has a selection of later soukous titles. Enjoy! That’s the point of soukous! Wonderful! I've been listening to Soukous since the mid-80s too, and I think it's still my favorite genre. I saw Kanda Bongo Man in the ballroom of a fancy hotel in Cambridge (the one in Massachusetts). It was great walking through the hotel lobby after the show -- all the fancy people watching a line of happy folks dripping in sweat from hours of nonstop dancing. Fantastic! Superb compilation and a great essay!